This cleanser is the first step in your daily routine to help fight the signs of ageing. Formulated with ingredients that reinforce the skin’s natural barrier, this creamy cleanser gently yet effectively removes dirt and make-up to leave skin soft, smooth and younger-looking. This, along with the Resist Advanced Replenishing toner broke me out really badly a 1,5 weeks into using. I got an unusual amount of acne this month and as I haven't changed anything else in my routine/diet I can only suspect this product. I have already had suspicions that Capric/Caprylic Triglyceride broke me out as I am acne prone, but as Paula's choice site doesn't put it to camedogenic category, I trusted it. Unfortunately I can't use this washer nor the toner anymore and now have to deal with acne in numerous places. Customer Care: Thank you for your review. We are sorry to hear of your experience. While this response is not typical, we do understand that each customer is uniquely different in how they will respond to products or ingredients. Please contact our Customer Care Team for further assistance. I like this cleanser. It's gentle, removes make-up very well and most of all it doesn't dry out my already super dry skin. I liked it so much that I have decided to reorder it. This time though when I received my package one of the cleansers had its pump turned to the position OPEN and great amount of the product was spilled/pumped out in the box. I am really disappointed by this. I cannot afford to buy only half of the cleanser for the price of a full one. I will give 5 stars to the product itself because it deserves it. Delivery -1!! !Customer Care : Thank you for your review and we are sorry to hear that the cleanser was damaged during transport. We will make sure that you will receive a new bottle as soon as possible. Eric - Super-Powered Cleanser ! This cleanser is an incredible 3-in-1 : it dispenses like (and has the gentleness of) a cream cleanser, (especially on sensitive skin and when water is hard), removes true stubborn makeup like a cleansing oil, and rinses completely without any residue like a cleansing gel, though it's richer than other PC's creamy cleansers and better for dry skins and/or during cold months. It slightly looses its slip after massaging a few minutes (I tend to use more of it to maintain the slip so the bottle won't last that long) and, as the consequence, the bottle is really too small, especially for a cleanser (one less star because of this) ! Derived from coconut oil and glycerin, it’s considered an excellent emollient to moisturise and replenish skin. Aqua, Caprylic/Capric Triglyceride (emollient/texture-enhancing), Glycerin (hydration/skin replenishing), PEG-20 Methyl Glucose Sesquistearate (cleansing), Methyl Gluceth-20 (hydration/texture-enhancing), PPG-20 Methyl Glucose Ether (texture-enhancing), Glyceryl Stearate (texture-enhancing), Stearyl Alcohol (texture-enhancing), Polyacrylamide (texture-enhancing), Decyl Glucoside (cleansing), Methyl Glucose Sesquistearate (cleansing), Camellia Oleifera (Green Tea) Leaf Extract (antioxidant), Chamomilla Recutita (Matricaria) Flower Extract (skin-soothing), Soapberry (Sapindus Mukurossi) Peel Extract (cleansing), C13-14 Isoparaffin (texture-enhancing), Laureth-7 (texture-enhancing), Xanthan Gum (texture-enhancing), Disodium EDTA (stabilizer), Citric Acid (pH adjuster), Caprylyl Glycol (preservative), Hexylene Glycol (preservative), Phenoxyethanol (preservative), Ethylhexylglycerin (preservative). 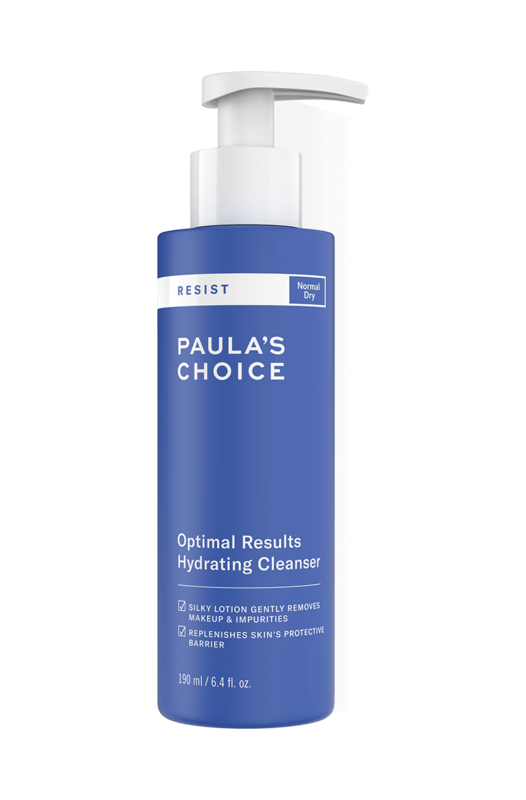 What is the difference between Resist Optimal Results Hydrating Cleanser and Skin Recovery Cleanser? Resist Optimal Results Hydrating Cleanser has a different texture to Skin Recovery Cleanser. Both are water-soluble cleansing lotions, but Resist Optimal Results Hydrating Cleanser has a lighter, silkier texture that is best for dry, sun-damaged skin. How is Resist Optimal Results Hydrating Cleanser ‘anti-ageing’? The gentle formula cleanses skin without disrupting its barrier. As a result, you’re not rinsing key elements skin needs to look younger and healthier down the drain every time you use it. This means your skin is able to hold on to the naturally-occurring elements it needs to strengthen and repair itself. When your skin-care routine respects the skin’s barrier and replenishes it with the ingredients it needs to look and act younger, you will see more youthful skin.